Repurposing this post. Helpful information for anyone on crutches! 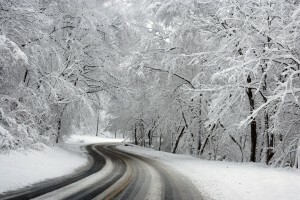 Nursing an injury during winter poses many risks and challenges. Any other season seems awkward enough getting around on crutches, but add snow and ice into the mix and disaster awaits. Of course, precautions and steps can be made to reduce the dangers and possibility of further injuries (and without becoming a hermit). In order to make sure crutches are as stable as possible, you will want them to be in the best possible working order. Even at the slightest show of wear, get new tips. New tips will help prevent sliding on the snow and ice. Since the tips grip the ground, a little wear can cause an accident. You can also purchase ice grip tips to help get even better traction on snow and ice. Also, make sure the crutches are adjusted to fit you perfectly so you can walk upright as comfortably and slowly as possible. Keep some sidewalk salt or sand in your car with you at all times. Whenever you have to get out somewhere that looks slippery spread a little sand or salt right outside your car door so you can get your crutches and steady yourself as safely as possible. You will want to keep your driveway and sidewalks salted as well, but when you have no control over the street conditions, keep that salt and sand handy to do the best at keeping yourself safe. No matter how well you do on crutches, they still pose a risk when used in the winter. Perhaps your Doctor has suggested crutch alternatives, like those offered by Goodbye Crutches. Goodbye Crutches has a variety of great devices that can help you get around easier and with more safety. The Seated Scooter, for example, is a wheeled device that allows you to sit and scoot yourself from place to place, while keeping your bad leg elevated and out of the way. You will remain stable at all times in the seated position and you don’t have to worry about slipping at all. The Knee Scooter works much the same way, only you stand and place the knee of your bad leg on the padded area. You have handlebars to keep you stable and a basket to carry your keys and other items. Even The Hands Free Crutch is a better option than crutches. This device attaches to your bad leg and allows you to walk much like normal, while retaining the use of your hands. Having your hands available to balance you is never a bad thing in the winter. Independence is important, but when it comes to your safety, sometimes you have to do what you have to do. Ask friends and family members to run some of your errands for you so you don’t have to venture out into the cold, icy weather. When you do go out, try to have someone meet you at your car to help usher you inside safely. Having one injury is bad enough; you don’t want to add another to it. In order to advance your recovery, you need to think of your comfort, as well as your safety. Things like cold toes can not only be uncomfortable and irritating, but also dangerous in colder temperatures. CastCoverz! Sleeperz! for leg casts (arm casts too!) and Sleeping Bagz! for boots are made from soft fleece to keep your toes warm and cozy, while protecting your sheets from snags and cooties, too! Be sure to check out our Bootz!, BootGuardz!, and BootGuardzXtreme! to keep your toes & boots protected from the elements and clean while wearing a walking boot out in snowy and rainy conditions. Think through other comfort levels and research what you can do to fix them during the winter months.